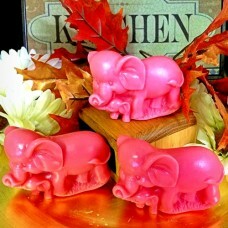 You get 3 of these adorable Elephant Melts. These are large enough that you can cut each one up into several uses. So sweet, I mean who doesn't like elephants!?! Packaged in a Kraft Bakery bag and tied off with homespun. Available in all our wonderful fragrances!